We’ve seen the headlines from hail and storm damage in Elk Grove Village, Schaumburg, and Itasca —”High Winds Rip Roof From Building”. Heavy hail and strong winds damaged not only roofs, but vinyl siding, screens and windows throughout the Northwest suburbs on commercial and residential buildings. The National Weather Service reported winds of 40-to-50 miles per hour. In Itasca, winds topped 74 mph. 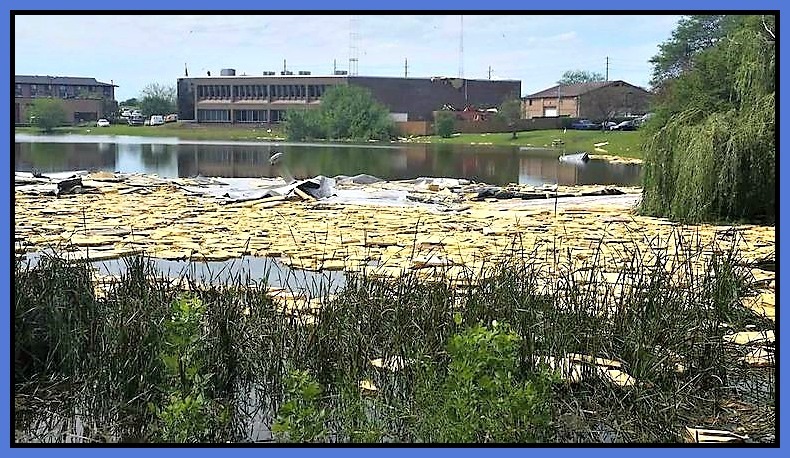 The remnants of the 24,000 square foot roof from Des Plaines Office Equipment’s corporate headquarters in Elk Grove Village lies in a nearby pond after high winds ripped it off in a fast moving storm Friday, July 21. The uninhabitable building will take about a year to repair and is only open to construction crews. SMART Construction Group is working alongside the immediate disaster recovery and remediation services crews on this commercial building reconstruction. SMART Construction Group is coordinating remediation, disaster recovery, and providing emergency temporary roofing. As the emergency repairs and restoration efforts progress, SMART Construction Group will also be focusing on coordination of the complete interior and exterior reconstruction efforts for the entire facility. Des Plaines Office Equipment President vows business as usual following the severe building damage from the storm, and will utilize the company’s other facilities as restoration of the Elk Grove location gets underway. If you have, or suspect that you have, hail damage or storm damage to your home, building, or residential or commercial roof, contact the experts at Smart Construction Group and Smart Roofing, Inc. at 847.797.0404 or or email contactus@smartroofers.com for your remediation, restoration and repairs!